Beginnings mean the opportunity to physically, mentally, and emotionally start over and such times often also prompt new chapters that signify advancement – especially where technology is involved. Well 2017 is no exception to the latter scenario and one of the first things that is likely to be catching the attention of music lovers and audiophiles alike in this new year, are Even’s H1 headphones. A company that is out to change the way people listen to music, Even launched sets of earbuds and over-ear headphones (the H1s) last year, with the latter officially starting to ship out in the first few weeks of December. What makes Even’s H1 over-ears stand out in a vast pool of high-end listening devices? The company’s factor of differentiation is all about built-in technology that creates an “EarPrint” unique to each wearer. Then, when this signature is activated by way of a simple button push on the headphones’ provided in-line remote, the headphones will immediately adjust incoming sound to provide playback that is supposed to be markedly more balanced and discernible for what that particular wearer needs. Users place the headphones on. Press the “E” even button on the in-line remote until a tone rings out. 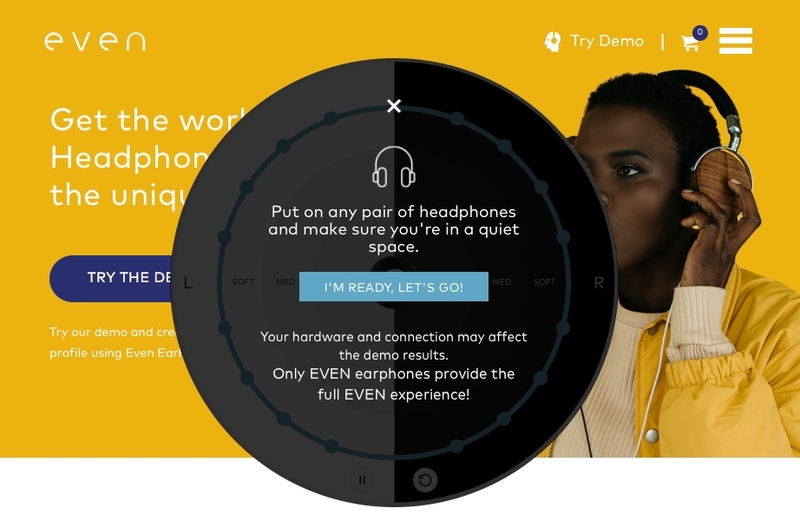 Following that, a built-in software program that contains a 90 second listening test will setup the wearer’s EarPrint with the help of Sara, a narrator included in the program who will walk people through the test. The test involves testing users’ hearing of eight different frequencies, one ear at a time, via playing back short clips of music in each ear. The only thing the wearer has to do is push the Even button as soon as they hear music in the indicated ear, which then cues up the next audio clip. Eight clips on each side, 16 in total, and after finishing, users can hear an instant before-and-after style comparison by pressing the Even button while music plays. Should intrigue be getting the better of anyone already, Even offers a demo of the exact same test as what’s in the H1s, that can be taken with any pair of headphones, straight from the website. Taking the EarPrint out of the equation for a moment, as a piece of audio hardware and a quality product for their price ($179 USD), the H1s deliver well. When listening to music without the EarPrint activated, the headphones provide a clear sound that feels fitting of its base specifications (32 Ohm impedance, 50mm Beryllium drivers, <3% total harmonic distortion, and a sound pressure level (SPL) of 110+/-2dB [decibels]). The equipment itself isn’t stingy with power and flexibility. Aesthetically, and physically upon wearing, the H1s also more than meet expectations. The dark brown, walnut wood housing, and metal arms holding each ear cup, (engraved with the Even logo) are a polished touch. 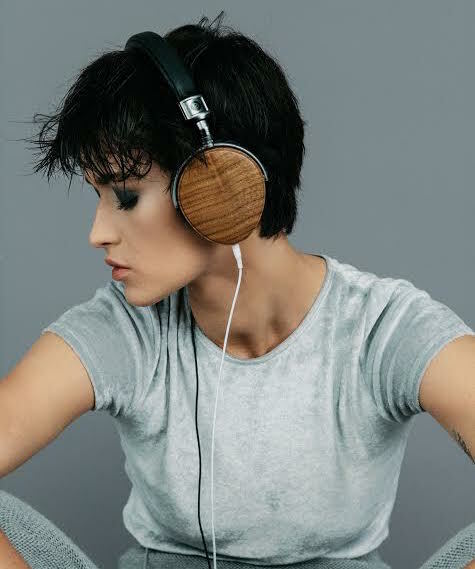 Combined with the soft, faux-leather cushioning around each ear cup and wrapping the headband, the H1s’ design attributes alone are worth praise. It doesn’t matter how expensive or technologically advanced a pair of headphones is if the user can’t stand to wear them comfortably for lengthy periods of time. No such problem plagues these headphones, as a couple of hours of near continuous wear (standard for even a short studio session) led to no feelings of irritation. Straight out of the box, the headphones will need to charge (via the provided micro-USB cable) for approximately 52 minutes, providing nine hours of audio playback. 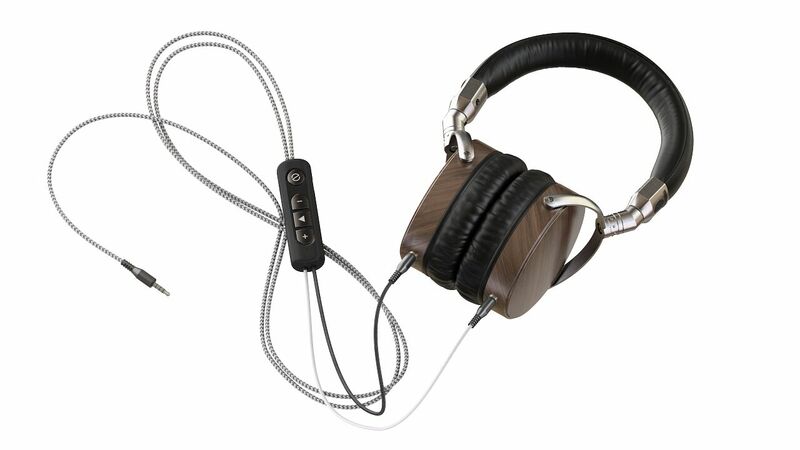 Despite the fact that these headphones have wires, the EarPrint technology requires some battery power to work and even if the adjustment is turned off, the battery is needed for audio to be heard. Perhaps subsequent generations of the H1s will allow for non-EarPrint, battery-free use. A black and white, dual wired, nylon cable connects the headphones to the in-line remote (no kinks!). The omni-directionality of the H1s mean the two cables can go in the jacks of either ear cup. The only important note is that once plugged in, the white cable should be worn over the left ear and the black cable should be worn over the right ear. The in-line remote provides the Even button, independent volume controls, a play/pause button, and a built-in microphone for taking calls with the H1s as well. Beyond the way the H1s look or feel, it’s the EarPrint feature that is meant to set them apart. The thought of a listening experience truly customized to an individual sounds like an audiophile’s dream – not to mention that of anyone working in the audio engineering sector, where precise listening is literally the job at hand. Does the touted technology make the impact it presents in the exuberant faces of its initial users and models? Well, that depends on what kind of impact a person is looking for in a drastically different listening experience. Knowing that the EarPrint test is meant to detect a person’s ability to hear a variety of frequencies and ultimately, help compensate for specific sonic ranges that are perhaps weaker in one ear over the other, it seems sensible to expect that listening to music with the EarPrint across a variety of genres, instrumental sounds, and songs emphasizing pitches across the hertz spectrum, would lead to a noticeable and consistent boost for certain types of sounds, creating the balanced feeling implied by the Even name. What was noticeable, was an immediate boost in gain (volume). However, a few initial runs of the EarPrint test created just the opposite of a balanced feeling and rather, a severe augmentation of the bass in my left ear. Taking the test multiple times, with breaks for rest in between, this discrepancy didn’t really change from test to test. Now, on average, the gradual loss in humans’ ability to hear frequencies due to age and everyday noise exposure (sensorineural hearing loss), tends to see the higher end sound drop off first (humans can hear between 20 hertz and 20 kilohertz). The thought that the lower, rather than higher range of my hearing might need such compensation was disconcerting to say the least. This perplexing thought and the volume increase in mind, after running the EarPrinted audio through a DAW and matching the levels of the volume between the before-and-after audio, it became clear that higher volume was a significant factor in the extreme change users are likely to perceive when flipping between listening with the EarPrint active and off. This isn’t to say that the H1s are just cranking the digital volume knob and leaving things at that. Running through the test a few more times – deliberately skewing the results to that of a listener with immediate hearing response and one with noted delay – to see if the EarPrint’s compensation levels would be definitively noticeable, there were sure signs that certain sonic ranges across the mid-range (e.g. guitars, some vocals) and high-end (e.g. hi-hats, synth keys) were in fact amplified or not, outside of what was primarily a bass boost permeating my initial trials. Is “Even” Even worth it? Cutting right to the chase of the above question but also somewhat not, the answer is yes and no. Aligning with what was stated in the beginning of this review, whether someone finds these headphones worth the investment depends on what they deem worth spending money toward. If someone were to demonstrate the H1s just as they are, but absent the EarPrint adjustment, the equipment is actually pretty satisfying from an all-around perspective and given the relatively start-up-esque status of the Even company and the quality of construction to the headphones, $179 USD doesn’t seem too far outside the realm of unsurprising in cost. Contrary to this point of view however, if one’s facet of interest and subsequent personal stake of value in the headphones lies mostly or solely in how much the EarPrint will alter how one listens to music, the return on investment might feel low, given how changes to the H1s’ sound are provided. Ultimately the decision on whether or not to get a pair resides in what defines a quality listening experience for someone and that – much like our individual hearing capability – is different for everyone.